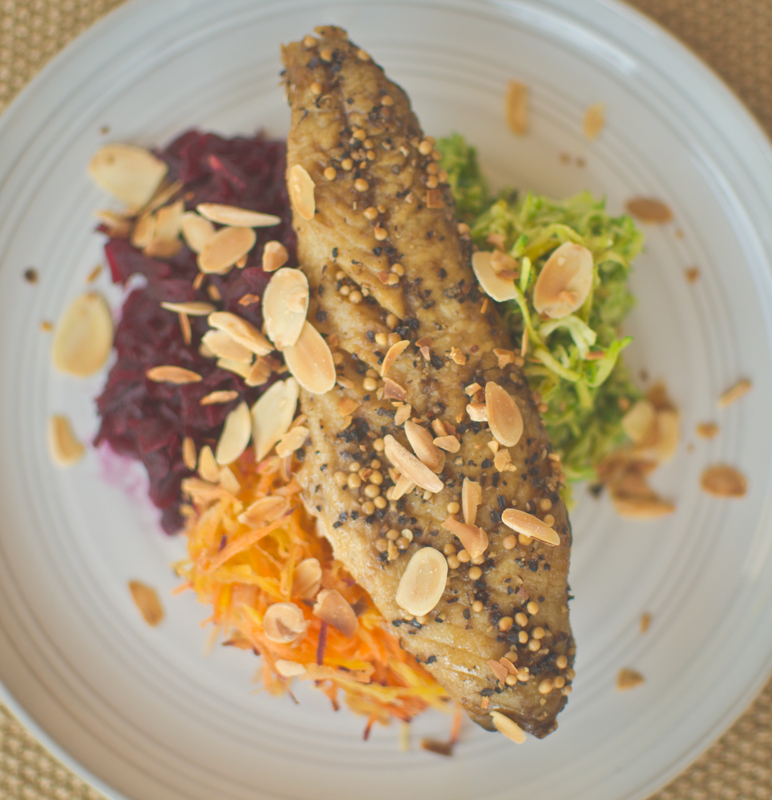 This recipe is similar to a rainbow on your plate, an anti-oxidant rainbow. So many beautiful colours like purple, orange and green. It is bursting with vitamins, minerals and anti-oxidants to nourish your body. The zucchini/courgette rice is not your typical white rice. It is zucchini grated and tossed in the pan with coconut oil. Mackerel is great source of omega 3 and vitamin D. One should include one to two portions per week of oily fish such as salmon, mackerel and herring; this will meet recommendations of 200mg DHA/day. Docosahexaenoic acid (DHA) is an omega 3 essential fatty acid , it cannot be made in the body, therefore, we must obtain from food sources. Beetroot is rich in antioxidants like Lycopene. This powerful anti-oxidant is responsible for the maintenance of skin elasticity and protecting the skin from free radicals. Carrots are an abundant source of vitamin A and Beta Carotene. This recipe is a great way to boost your daily vegetable and fibre intake. Grate the beetroot, carrots and zucchini. Set beetroot and carrot aside until ready to serve. Zucchini Rice: in a pan on medium melt 1/2 tsp. coconut oil or oil of choice, add grated zucchini and cook for 2-3 minutes, season with salt, pepper and squeeze of lemon juice. Remove mackerel from packet and plate up. Layer your ingredients and pop the mackerel fillet on top. Serving suggestions: toasted flaked almonds and an orange vinaigrette. To make Orange Vinaigrette: 3-4 tablespoons Cold Pressed Olive Oil,1-2 tablespoons Apple Cider Vinegar,1 tablespoon Rice Syrup,1/2 Orange, juice only,1 Orange Slice, Coarse Sea Salt, Fresh Ground Pepper. Pop all ingredients except orange slice in a bowl and whisk until rice syrup is dissolved and emulsified. Add orange slice at the end. Season with salt and pepper. Set aside and serve with meal. Spoon it over your meal.